First, the one line summary. The Lord is King. Even away from the land; even over great rulers like Nebuchadnezzar. The Lord is King even when our lives are threatened. The Lord is King over all the politics across the world. The Lord is King in times of trouble. The Lord is King through regime change, through persecution. The Lord is King. Let’s summarise. Daniel taken into exile as a young man – still in his teens. He lives most of his life as a servant of the Babylonian kings, principally Nebuchadnezzar. In his early days he faces issues of compromise, as do several of his friends. He interprets dreams, and becomes a trusted Royal administrator and advisor. He survives the transition to Persian rule, which comes at the end of his working life, as the Babylonian empire and emperors become more decadent and corrupt. In his old age, as Cyrus takes over, he becomes aware that return to Israel is pending, and he commits himself to prayer. There are two consequences. One is that Cyrus does indeed send the Israelites home – though Daniel doesn’t go. And the second is that Daniel receives from God a sequence of increasingly more detailed visions of the future. Those visions, like his earliest visions, detail the way that the history of the region would go in years to come – Babylonians, Medes & Persians, Greeks and Romans. And the visions pay particular attention to the Greek Seleucid dynasty, and to one ruler in particular, Antiochus Epiphanes. The last vision is the most detailed, and the most confusing. Let me get that bit out of the way. 11:36-40 seems to relate to the death of Antiochus Epiphanes. If it does, then it doesn’t tie up with other descriptions. Could be that the prophecy has moved beyond that specific historical event, and is even further in the future. Could be that the previous bits were written after they had happened, and the last part is meant to relate to Antiochus’ death, but the writer guessed wrong. I’m not satisfied with either of those explanations. I think that 36-40 is a summary of the whole of Antiochus’ career – then it makes sense. A restatement. But in any case, the principles still have a further application. They do indeed still apply when you think about the rise and fall of Roman power in Israel. And they still apply to the rise and fall of any of the ‘anti-Christs’ that came after. Why? Because tyranny looks the same every time. Power leads to pride, which leads to hubris, which leads to destruction. But back to Daniel. He meets up with Gabriel again in this vision. And before Daniel receives a detailed vision about Israel’s future, which would be ‘sealed up’ for a coming generation, Gabriel explains why he’s a bit late. And as he does so, he lets us in on a secret. Daniel was a teenager when he went to Babylon. Now it’s 70 years later – he’s well into his 80s. He’s lived faithfully through several kings, outlived lots of lions, been vegetarian, been governor, and more. He’s carried on praying through all this. God does not need short-termers. The description of all that will happen covers hundreds of years, and Gabriel tells Daniel that his praying has played a part. God is sovereign – but history moves slowly. Be steadfast. Be patient. 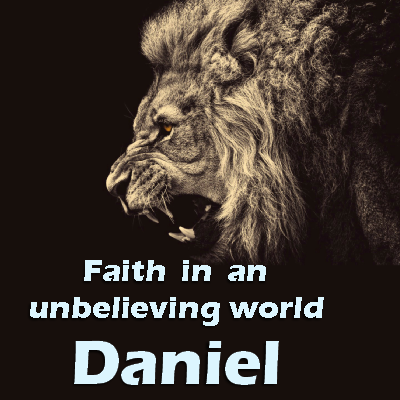 I say prayer – Daniel specifically added ‘fasting’ to the praying. It’s about focus. It’s a partial fast – no meat, no marmite. Cut back on the wine and olive oil. But astonishingly, Gabriel turns up. And he seems to be saying that he broke off from the battle in order to talk with Daniel. For no other reason than Daniel’s prayer. Little people can have great angels. Persia had an angel – not on the right side. Greece also. Those were the major kingdoms of the world. But little Israel had a prince too. They had Michael. And they would win through. I can’t prove much, if anything, about angels. And the study of angels has been a distraction and a diversion too often in the past. But God lets Daniel see that Israel has an angel. And the sense that nations, regions, maybe even individuals have something unseen behind them – that there is a character, a personality which lies behind both good and evil – is widespread. I’ve always believed that Betty Pratt had a particularly impressive angel – kept especially busy when she was driving. The decisive battle has been fought. The prophesies of Daniel fit in each generation simply because people don’t change. But the ultimate battle is the one that goes on in heaven – Rev. 12:1-12. And we’re picking up the pieces. Jesus’ death on the cross is the turning point of this battle. Once again, the faithful witness of God’s people is key to this battle. But the battle has been won. The power of Satan is broken. But he is at large.